This post originally appeared on the Dealspotr blog. Dealspotr is the most accurate coupon site that pays you to save. I'm @ellenblogs on Dealspotr, use my link to join today and earn 5,000 bonus points. I am a Dealspotr Ambassador. Do you love your pooch? Do you wish you had more time to shop for new toys and treats to make him happy? 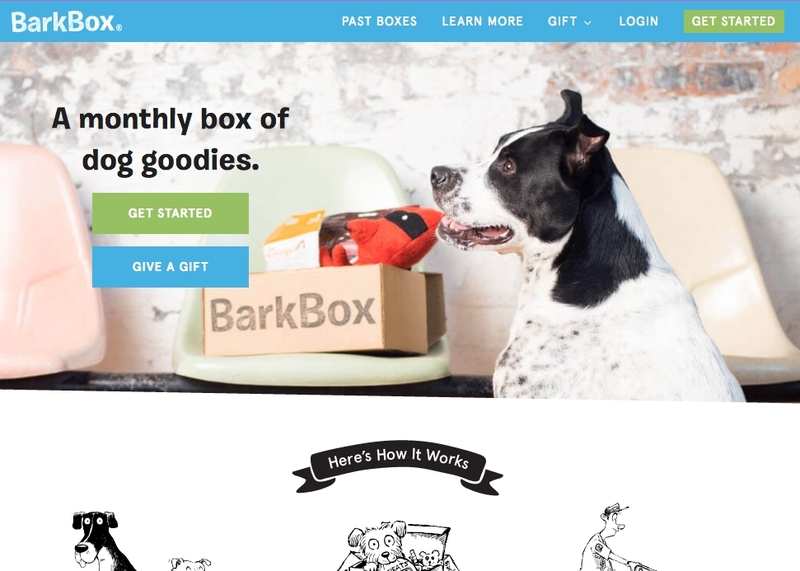 If so, a pet subscription box from BarkBox, PetGiftBox, or PupBox may be perfect for you! These boxes are filled with toys, health items, and treats for your pet and sent right to your door every month. By subscribing to one of these boxes, you can keep your pup happy and healthy without spending hours at the pet store. To make sure you pick the best one for your pet, read through our comparison below. BarkBox is the most popular and oldest of these subscription boxes, supplying high-quality, dependable products your dog will love. Each box has a specific theme, which is reflected in its contents. This box is also one of the least costly options and donates 10% of its profits to shelters throughout the U.S. and Canada. BarkBox is the best option for owners who want organic products and for those whose dogs have allergies. Each BarkBox comes with 4-6 customized items, including dog treats, gadgets, all-natural treats, and hygiene products. All treats are guaranteed wheat-free, corn-free, filler-free, and soy-free and often made with organic products. Each box contains different, new products and BarkBox guarantees that you’ll never get the same box twice. If you get an item you like enough to buy again, you can find it at the BarkShop. BarkBox makes its boxes based on dog size to guarantee that your pet will get toys and treats in the right size for their enjoyment. Sizes include the “Small & Cute” box for 0-10 lbs, “Just Right” for 20-50 lbs, and “Big & Bold” for 50+ lbs. If your dog has allergies, you can order a special box to avoid any troublesome ingredients. Along with the organic treats included with every box, BarkBox offers chicken-free, beef-free, turkey-free, and gluten-free options. If your pup is rough with her toys, you can add an extra toy to your box for $9/month and avoid more trips to the store. Subscribers are asked to pay the full amount for their one, six, or 12-month subscriptions at the time of purchase and plans automatically renew. If you have multiple dogs, you can get a multi-dog discount. BarkBox has a simple, easy-to-use website and offers good customer service. Its blog, the BarkPost, offers several tips and fun tidbits for pet owners. Many subscribers enjoy BarkBox’s funny and informative social media accounts. A mobile app is available for iOS and Android and users can order online and through texting. Tracking is available for in-transit boxes. PetGiftBox is fairly new to the subscription box scene, but it has made its mark on the market. These boxes can purchased for both dogs and cats and, like BarkBox, each has its own theme, which is reflected in the contents. This company pet-tests all products before including them in its monthly boxes. PetGiftBox donates a portion of every purchase to America’s VetDogs, an organization that supports veterans with disabilities. This is the best choice for cat owners and a great option for dog owners who want to pay monthly instead of upfront. These boxes include toys, treats, and other fun goodies. These toys can vary from balls to squeaky toys, all American made, and you get a variety of treats. Additional goodies include items such as leashes, smell-masking candles, and more. PetGiftBoxes come in three sizes for dogs — Petite Pup (0-20 lbs), Mid-Sized Pup (20-50 lbs), and Hefty Hound (50+ lbs) — and one Purrfect Size for cats. When ordering, you select your pet’s gender to help them further customize the items you will receive. You also include your pet’s name during the ordering process. PetGiftBox offers a helpful, easy-to-navigate website and subscription process. Its blog features videos, pictures, and articles for animal lovers and pet owners. Each box is wrapped like a present, including a bow and tag, and includes a card to show you the value of each item. You can also gift a box to fellow pet owners. Tracking is available and a notification is sent when your box is shipped. PupBox is a bit different than the other two boxes because it mainly focuses on puppies. Your PupBoxes are customized to your puppy’s age and each includes tips and training items that are most helpful for your puppy’s age and size. Boxes for adult dogs are available as well, but these aren’t age-customized and include a variety of items for adult dogs of any age. 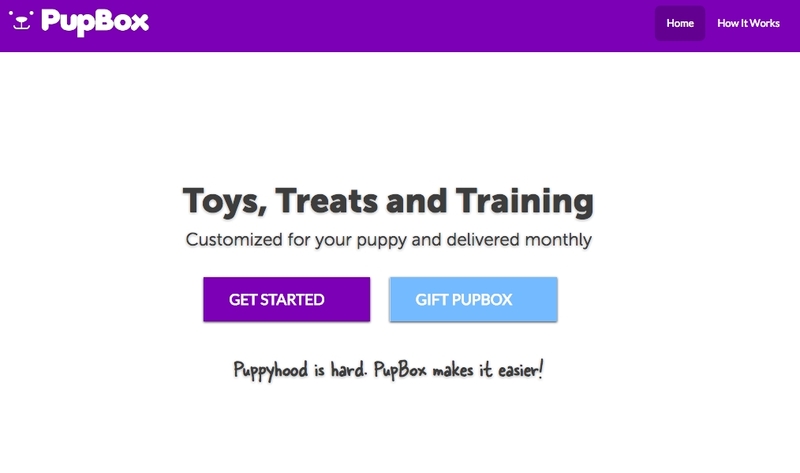 If you have a puppy, this is the subscription box for you. Each box contains 5-7 items, one of which is always a bag of training treats. The rest of the items are geared to your puppy’s training stage. If your puppy is teething, you’ll get more chew toys and if you are working on potty training, you can get pee pads or pee spray. Many products are hypoallergenic and some treats are made with just one ingredient. Each box also comes with a card of training tips and facts. If you want to reorder any of the items you receive, they are available for purchase in the PupShop. PupBox has four box sizes to choose from, all based on your puppy’s target adult weight: small (0-20 lbs), medium (20-60 lbs), large (60-100 lbs), and extra large (100+ lbs). Of all the boxes reviewed, PupBox offers the most customization for your pet. To subscribe, pet owners create a pet profile that includes birthday, gender, coat type, adult weight, and more. This information will help you get the right training and development information at the right time. PupBox offers tips and fun facts for puppy and dog owners on its blog. This company is also on social media, where you can find tips, facts, and coupons. Emily Finlay posted this article on the Dealspotr blog. I love the idea of getting a box for my kitties but they are so picky and don’t like treats.Instead,I like to surprise friends who have dogs by sending them these boxes.I hadn’t heard of pupbox before but I will be giving it a shot for my friend who has a new puppy! Thank you! I wish so bad that I could get my kitty A gift box. i know she would love it! she always knows when something is hers. Even when we go the store she will always find the bag thats hers, its so cute cause she knows I always bring something back for her. Being in this place makes me miss her sooooo bad. It must be so hard to be separated! I will have to check into these boxes. I have been thinking about getting a subscription for my pets. Thanks for the reviews. I’ve tried the PetGiftBox before. My dogs loved it the treats and toys, but the boxes would always come with an item or two that we would never use. I never even thought of pet subscription boxes!This is great and I will have to look into them. I would love to try this for my cat Roo! She loves her toys! I’m sure that she’d love receiving one! I’ll have to share this with Carol. She was just asking me about subscriptions for her babies (my grand-dogs) so I know she’ll love the info here! Thanks for sharing! Thank you so much for sharing, Janice! I’ve wanted to look into a pet subscription for my pooch for some time now. I think she would be so happy to jump into her own box.